When we aren’t picking out the perfect frames for our patients or performing expert eye exams, we are exploring our great state. 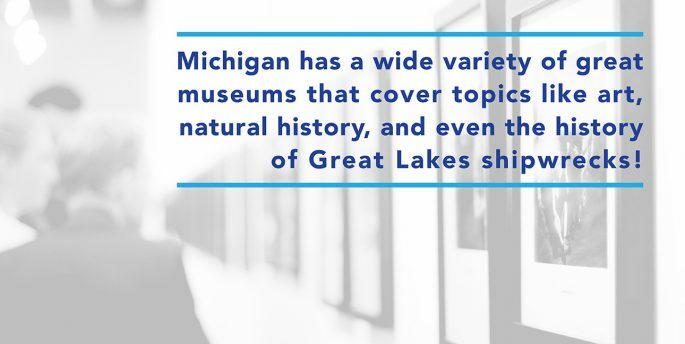 Michigan has a wide variety of great museums that cover topics like art, natural history, and even the history of Great Lakes shipwrecks! We’ve rounded up our favorite museums to share with you. Check out our favorite places to visit, including one museum that just opened recently. This museum is brand new and is truly out of this world. Head over to Ann Arbor and enjoy the exhibits that range from a trail of Mastodons to flying reptiles. If you want to get out of this world for a night and view the stars in the sky, check out their planetarium dome and theater. The museum is open every day from 9 a.m. to 5 p.m. with late night admittance on Thursdays. What’s even better is that the museum is free, and the planetarium is only $8 per person. Did you know that the Detroit Institute of the Arts (DIA) is considered to have one of the best art collections in the United States? There is so much culture in the city of Detroit and the DIA captures the culture of the city very well. From mummies and modern art to European art and African masks, the DIA has it all. One of our favorite showcases at the DIA is the General Motors Center for African American Art which contains over 400 pieces by African American Artists. The DIA is open Tuesday through Thursday from 9 a.m. to 4 p.m., Friday from 9 a.m. to 10 p.m., and on the weekend from 10 a.m. to 5 p.m. Admission fees range from free to $14. Ready for three floors of fun and discovery? The Grand Rapids Public Museum features core and traveling exhibits that focus on science, history, and culture. The museum is in the heart of the downtown Grand Rapids area, so after you visit the museum, you are just a few steps away from great dining and more adventure. The Grand Rapids Public Museum is open Monday through Friday from 9 a.m. to 5 p.m. and on the weekend from 10 a.m. to 5 p.m. Admission fees range from $2 to $12. If you are planning a trip up north, definitely make a stop at the Great Lakes Shipwreck Museum in Paradise (yes, Paradise) Michigan. Learn about the history of ships on the Great Lakes and about current underwater research. There are many interesting artifacts in the museum from shipwrecks and also from ships who sailed the Great Lakes unscathed. The museum is open daily in May through October from 10 a.m. to 6 p.m. There are family pricing packages and single person admission fees that range from free to $13. Our team of optometrists and doctors want you to be able to learn about our great state with clear vision. Stop in for an eye exam before you explore these great Michigan museums. Eye strain is a common condition that can occur when your eyes become tired from heightened use. This is usually caused by driving, reading, or the continual use of digital screens. Although eye strain can be very uncomfortable and annoying, it is generally not a serious condition and often goes away once you take a break to rest your eyes. However, there are measures you can take to avoid eye strain altogether. Our expert team has put together a few suggestions on how to prevent straining your vision in your day-to-day routine. You are most likely suffering from eyestrain if your eyes are sore, itchy or burning, especially if your eyes are also notably watery or dry. Vision often becomes blurred or doubled because of eye strain. Your eyes may become sensitive to light, you will typically have trouble concentrating, and you won’t be able to keep your eyes open. Headaches, back pain and neck pain are other common symptoms. If you are experiencing these symptoms, schedule a visit with your optometrist so that they can properly diagnose you. There are simple remedies to help alleviate eye strain, no matter where you are. Began by reducing the light in your room. To do this, try positioning your light source behind you or try using a shaded light. The shade will keep the light from shining directly in your eyes, which will help decrease symptoms. If you use a digital screen often, whether it be for reading or typing away in spreadsheets for work, there are ways to keep eye strain at a minimum. Blink often to refresh your eyes and prevent them from drying out and take a break from your work every 20 minutes. 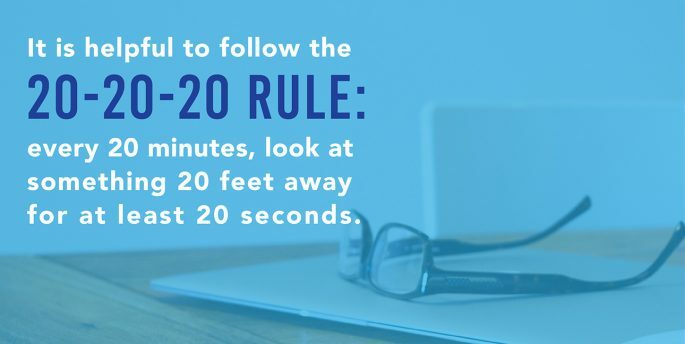 In fact, we find it helpful to follow the 20-20-20 rule: every 20 minutes, look at something 20 feet away for at least 20 seconds. It might also help if you adjust your laptop to be at least an arm’s length away. Position the top of the screen so it is at or just below your eye level. You can also adjust your screen settings to enlarge the font in order to make reading from that distance easier. The digital world can cause more than eye strain. Learn all about how devices are impacting your sight on our recent blog. The best thing you can do for your vision is schedule an eye exam. Before your exam, start keeping a log of the time you spend on activities that strain your eyes and note what symptoms you have been experiencing. Your doctor will be able to diagnose and provide treatment to alleviate your eye strain. Our team of optometrists knows how annoying eye strain can be when you are just trying to enjoy your favorite book, newspaper, or TV show. Follow our tips for improving your symptoms, and stop in for an eye exam so that we can help you further. Your eye color is unique to you. In fact, no two people have the exact same color of eyes. Because of this, eye color is one of the most distinguishing characteristics for people and is often a big part of identity. We’ve already written about the science behind how you get your eye color, but does that color also affect your vision? In order to understand how eye color affects your vision, it will be helpful to understand how eye color develops. The iris is the colored part of the eye, and the amount of pigmentation within the iris determines your eye color. There are three genes that are responsible for determining the pigmentation. These genes are tied to your melanin levels. Less melanin in the iris means lighter eye colors, like blue and green, and more melanin makes for darker eye colors, like hazel and brown. Check out our eye color science blog to learn more about determining eye color. Whether you have light or dark colored eyes, your eye color does actually have an impact on your vision. If you have a lighter eye color, your eyes are more sensitive to light because you have less pigment and melanin in your irises to protect your eyes from the sun. This means that you could have a greater risk of macular degeneration, and that you might find yourself squinting more when you go outside during the day. If you have a darker eye color, your eyes can often withstand high glare lights better than light colored eyes can. This is thanks to the greater amount of pigment and melanin in your iris. You could potentially be better at driving at night because your eyes allow for less light to reflect and cause glare. Despite your high light tolerance, though, you should still be wearing sunglasses to protect your eyes from UV rays. There are a few studies that have looked at the impact of eye color on sports performance. The University of Louisville found that people with dark eye colors perform better at reactive tasks like hitting balls and playing defense, while people with light eye colors do better at self-paced tasks like hitting a golf ball, throwing a pitch, or bowling. However, there are not enough studies yet to fully support this theory. For now, it’s just a fun discussion to have with your teammates. Speaking of teammates, our expert team is here to ensure that you are able to see clearly, regardless of your eye color. An annual eye exam will help you take care of your eyes, whether they are dark or light-colored. Stop in to one of our 54 locations or call us to set up your appointment today! Spring only seems to exist for two weeks in the Midwest, thanks to never-ending snow, and that’s why us Michiganders love spring break more than anyone else! This week of bliss allows us to take a break from miserably cold weather and relax under the sun, with our feet in the sand. If you’re planning a trip down south to the ocean, we are sure you are packing essentials like sunscreen and sunglasses. Are you also packing your contacts? The ocean and your contacts can be a dangerous mix at times, and we want to help you protect your vision and enjoy your vacation! Our expert team has compiled all the information you need to know in order to keep your eyes and contacts safe this spring break. 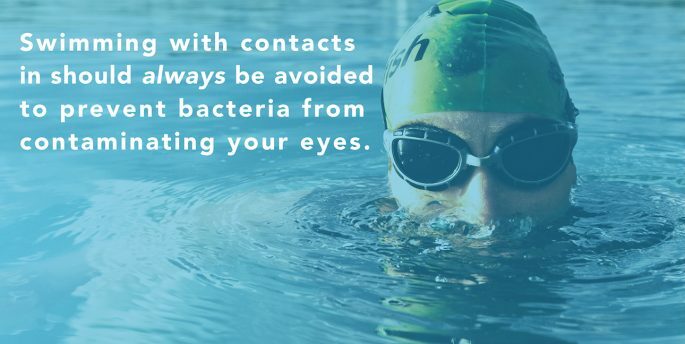 Swimming with contacts in should always be avoided to prevent bacteria from contaminating your eyes. According to the FDA, contacts should not be exposed to any kind of water, including tap water, pool water, and ocean water. Water is home to many viruses, including the dangerous Acanthamoeba organism, which attaches to contact lenses and can cause the cornea to become infected and inflamed. This can cause permanent vision loss or require a corneal transplant to recover lost vision. Other eye infections can occur when swimming with contacts, like a corneal ulcer. Corneal ulcers occur when a bacterial infection invades the cornea, and contact lens wearers are the most susceptible to eye irritation, as the lens may rub up against the eye’s surface. But I Will Wear Goggles! If you choose to wear contacts while swimming, you can reduce the risk of bacterial infection and irritation by wearing waterproof swim goggles. Swim goggles will help to keep your contact from leaving your eye when swimming. However, the best way to prevent your eyes from becoming infected while swimming is by taking out your contacts before jumping into the water and putting on a pair of prescription goggles. So, you decided to wear your contacts while swimming. Our expert opticians recommend discarding the lenses immediately after swimming, rinsing your eyes with artificial tears, and replacing your contacts with a fresh pair. If you experience eye irritation or sensitivity to light after wearing your contacts in the water, you need to call your eye doctor immediately. Do you have more questions about swimming and contacts, or need tips on what eye care essentials to pack for your spring break trip? We would be happy to help you out! Visit one of our 54 locations or give us a call. Your diet impacts all parts of your health, including your vision. In the top five foods for eye health, we shared the importance of a diet that consists of food high in omega-3 acids and how they benefit your vision. While nuts and seeds both are rich in omega-3 fatty acids, they also contain high amounts of vitamin E. Vitamin E great at protecting against age-related eye damage. Nuts and seeds also make for great on-the-go snacks, stash some in your desk drawer or your purse! Do you know why carrots are orange? It’s because they are full of beta carotene! Beta carotene is a nutrient that helps the body make vitamin A, which in turn boosts your vision in multiple ways. Vitamin A plays an essential role in your vision health, vitamin A has a protein called rhodopsin. Rhodopsin helps your retina to absorb light. Like carrots, sweet potatoes are rich in beta carotene and vitamin E. Vitamin E is an antioxidant which means it can help to lower the risk of infections throughout your body and protect your eyes from eye disease, most commonly, age-related macular degeneration. Sweet potatoes are a great side for your main dish, just make sure you don’t dose it in brown sugar and butter! Zinc has been linked to better long-term eye health, including age-related sight loss and macular degeneration. Beef is a meat that contains a high level of zinc, even more than chicken breast and pork. Zinc will benefit your eye health and vision through strengthening your retina and the tissue around your retina. While it’s not a food, water should be a part of your everyday routine. Maintaining a healthy balance of fluid in the eye is vital to protecting your eyes. Your eyes are surrounded by fluid that washes away debris and dust every time you blink. When you are not well hydrated your eyes become dehydrated as well. 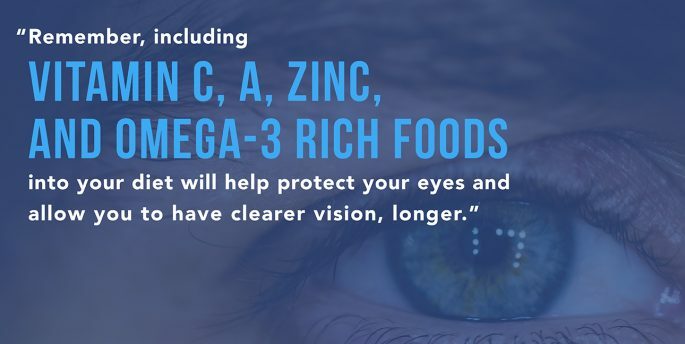 Remember, including Vitamin E, zinc, and omega-3 rich foods into your diet will help protect your eyes and allow you to have clearer vision, longer. Interested in learning more about the foods you should add to your diet in order to boost your eye health? Schedule an exam with one of our doctors to discuss the steps you can take in order to achieve healthier eyes. At Rx Optical, we understand the importance of educating both our current patient base and the general public on best practices surrounding eye care and your overall health. 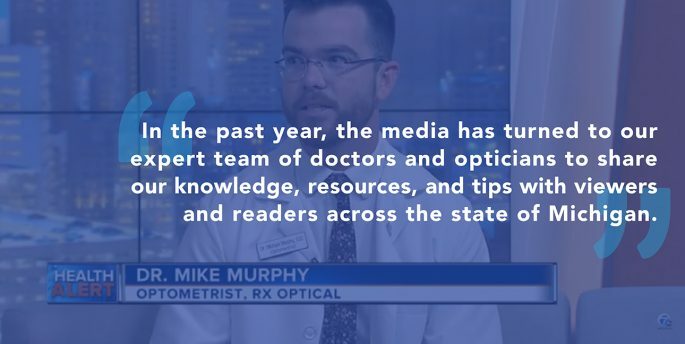 In the past year, the media has turned to our expert team of doctors and opticians to share our knowledge, resources, and tips with viewers and readers across the state of Michigan. 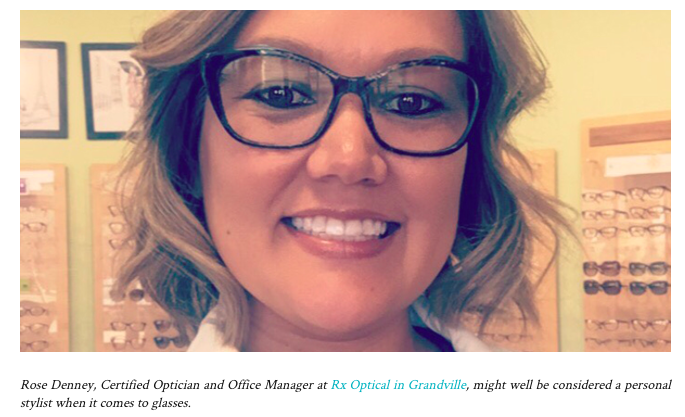 Rose Denney, Optician and Office Manager at the Grandville Rx Optical location, sat down with West Michigan Woman in April 2018 to share insight into how she helps patients pick out the perfect frames that fit their face shape and overall style. Rose’s training and education make her an expert in both eye care and personal eye wear styling. Check out the full piece here. National Sunglasses Day, celebrated annually on June 27, is, unsurprisingly, one of our favorite days of the season. 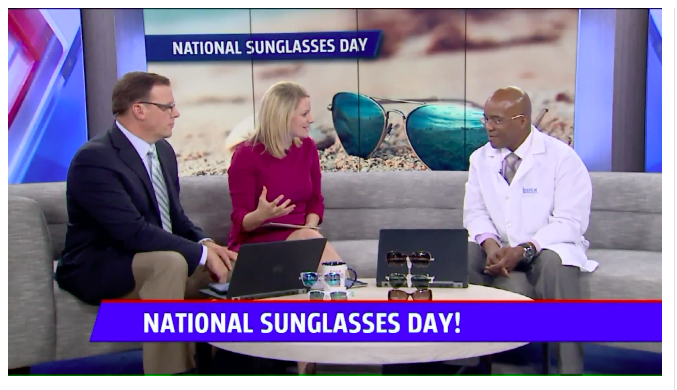 Anthony McConer, Office Manager at Rx Optical Breton Village, stopped by the FOX 17 studios to chat about why it is vital that you wear sunglasses with proper UV protection. He also covered different style trends and discussed how to pick the right frame size and shape. Check out Anthony’s interview here. We can’t wait for National Sunglasses Day this year! Getting ready to send your kids back to school in August can seem like a daunting task. From gathering new school supplies to learning how to fall back into a normal routine, there is a lot to take care of. One very important item that tends to be overlooked: a comprehensive eye exam for children. 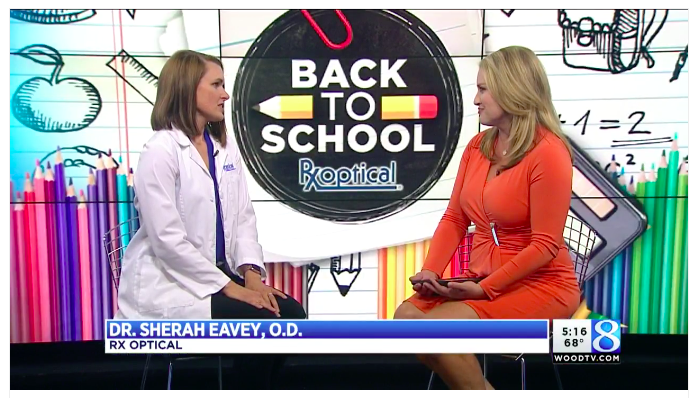 Dr. Sherah Eavey sat down with WOOD-TV to share a few of the red flags to be aware of when it comes to children’s eye health issues. Check out the must-see, back-to-school segment here. Our doctors always keep an eye out for potential eye health threats based on the season. Dressing up for Halloween in the fall is always a fun tradition, however, the trend of unregulated cosmetic lenses are posing serious threats to users. 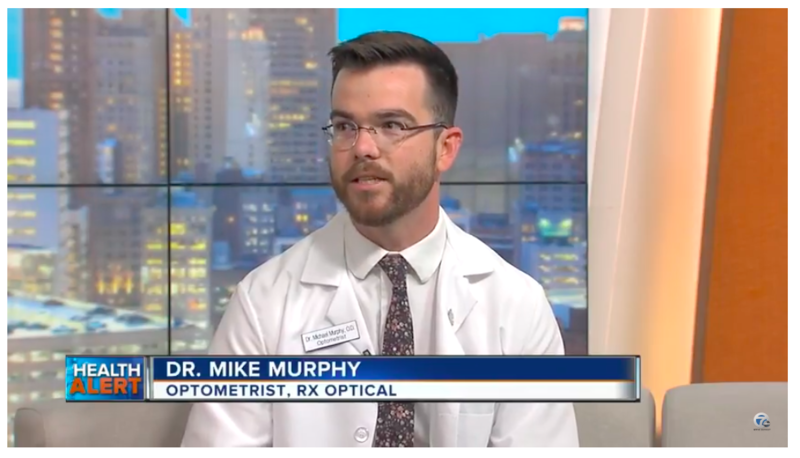 Dr. Mike Murphy shared the dangers of cosmetic contact lenses with the team at WXYZ-TV in Detroit. Check out the vision-saving interview here. At Rx Optical, we are committed to educating and informing patients and the general public about the latest eye care news, tips or threats. We also love being the go-to experts for eye wear fashion trends. No matter the season, and no matter the topic, our team at Rx Optical has you covered. Keep your eyes peeled for more of our doctors and opticians being featured in the media in 2019. Want to meet our talented team of media stars? Find a location near you or schedule your appointment online today. You know the saying, “You are what you eat”? The food you eat plays a huge part in your health. 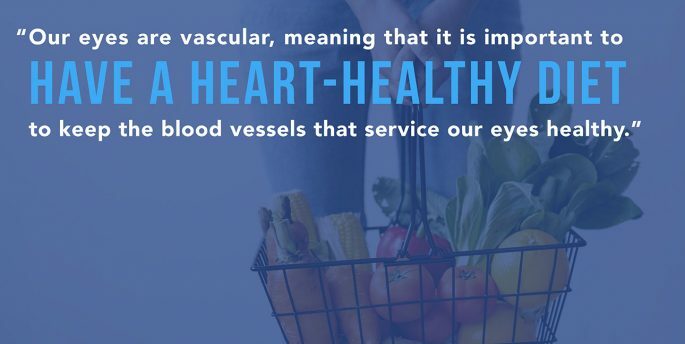 Our eyes are vascular, meaning that it is important to have a heart-healthy diet to keep the blood vessels that service our eyes healthy. Tiny capillaries provide your retina with nutrients and oxygen; because these vessels are so small, fatty deposits can easily cause blocked veins. We’ve shared with you the foods that will boost your eye health. Now, our expert team of doctors have compiled a list of the foods that are harmful to the health of your eyes. The toppings that you likely store in your refrigerator door like mayonnaise, salad dressing, or jelly, are all high in fat. Rather than using these options for flavor on your next sandwich, burger, or salad, try using natural flavors like green vegetables or toppings that are packed with vitamin C, like a squeeze of fresh lemon. Get great flavor with natural foods without sacrificing your nutritional benefits! Think about the white foods that you eat: pasta, white bread, rice, and flour tortillas. These foods offer almost no nutritional benefit, just simple carbohydrates that give a rush of energy that are followed by a crash. If you are eating these foods, be sure to add greens and foods that rich with omega-3 to the meal to provide yourself with nutritional benefits. Or, swap them for healthier alternatives that use whole grains. Red meats and sausages are often convenient to purchase, especially when you are buying from the deli. Lunch meats can seem healthy but are mostly full of chemical preservatives, salt, fat, and cholesterol. Instead of consuming fatty meats, try adding in lean meats like fresh turkey, which is full of zinc and protein. Salmon is good alternative as well, as it is an omega-3 rich food. Margarine is often marketed as a healthy alternative to butter, but is full of trans fats that can adversely affect your cholesterol. Instead, try using coconut, avocado, or olive oil as an alternative to both margarine and butter to avoid trans fats. Junk foods are delicious but can cause serious issues down the line for your health if you consume too many. Rather than eating French fries, cookies, or potato chips, which are all full of unsaturated fats, swap them out for healthy saturated fats. Lean meats, fish, fresh fruits and veggies, and low-fat or non-dairy products are the best way to receive healthy fats. We want to help you eat healthy so that your vision remains clear and focused. Do you have questions about how to eat healthy for your eyes? We would love to see you! Stop in or schedule your appointment today. 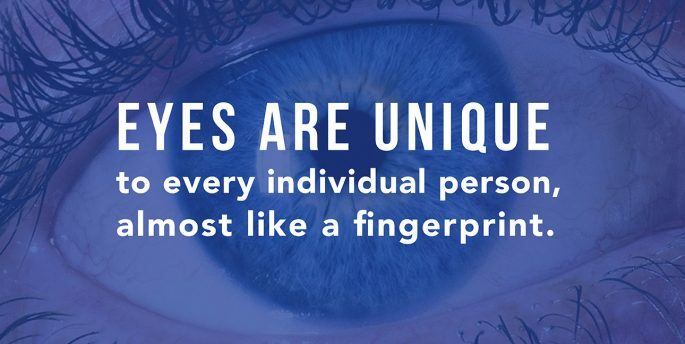 Eyes are unique to every individual person, almost like a fingerprint. But, have you ever found yourself wondering, for example, why your eyes are brown and your sister’s eyes are blue? Shouldn’t you have the same eye color if you are related? The science behind eye color is a little more complicated than what you may have learned in your high school biology class. In high school biology you probably covered genetics and dominant and recessive genes. In order to fully understand this, you likely did an activity where you traced your eye color back to your parent’s. However, understanding how dominant and recessive genes play into eye color is just scraping the surface of the science behind your eyes. Different eye color is caused by the melanin in your iris. The iris is a flat, colored, ring shape behind the cornea of the eye. Less melanin in the iris means lighter eye colors, like blue and green, and more melanin in the iris makes for darker eye colors, like hazel and brown. Melanin isn’t the only factor in determining eye color. Like you learned in high school, genes do play a role, but it isn’t just the one gene you were taught. 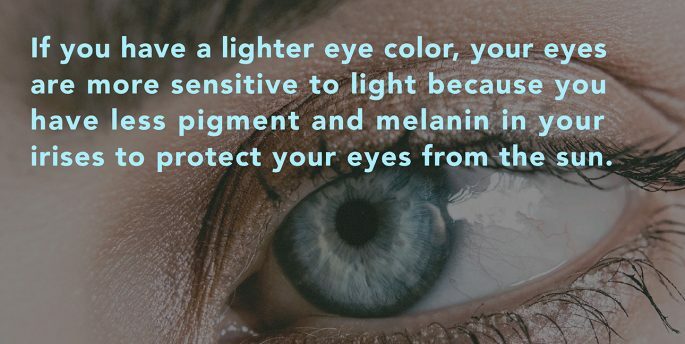 The gene OCA2 determines how much melanin you will have in the iris, because it produces protein. Less protein means blue or green eyes. The gene HERC2 limits the OCA2 gene. So, the more that HERC2 limits the OCA2 gene, means less melanin in the iris. Melanocyte is the mature, melanin-forming cell. The activity level of melanocyte in babies can contribute to a change in eye color up until their 1st birthday. If melanocytes secrete only a small amount, a baby will have blue eyes. If melanocytes are very active, a baby will have brown eyes. Did you know that most American Caucasian babies begin their life with blue eyes, but only 1 in 6 adults retain the blue eye color? Sometimes, eye color is determined by anomalies in melanin and genetics. Heterochromia Iridium is a condition where each eye is a different color. Heterochromia Iridium occurs when there are anomalies in the iris. Only 6 in 1,000 have this condition. Most people know that David Bowie has 2 different eye colors, so you may think that he has Heterochromia. Bowie’s condition, however, comes from eye damage from a fight as a teen over a girl, which led to a permanently dilated pupil, which is known as anisocoria. Max Scherzer, former Detroit Tigers pitcher, currently with the Washington Nationals, does, however, have Heterochromia. At Rx Optical, we understand your eyes and the intricate science behind them. We would love to see you and learn more about your eye color and your eye health. Schedule your appointment with us online today. 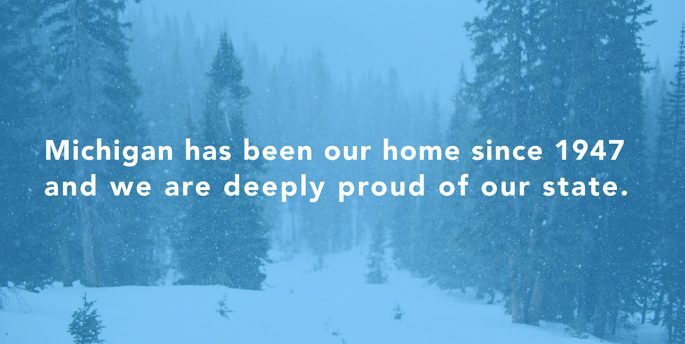 Michigan has been our home since 1947 and we are deeply proud of our state. While we will admit that Michigan winters can be tough sometimes, we also know they can be stunningly beautiful. There’s just something about the way the snow glistens on the bare tree branches when the light hits just right, and just like that, Michigan turns into a winter wonderland. A trip to the Upper Peninsula is always beautiful, no matter the season, but in the winter it is transformed into a breathtaking, frozen tundra. You can ski, hike, and even climb frozen ice waterfalls. The frozen lake is captivating to look at and is truly embodies “Pure Michigan.” Remember, if you’re headed way up north, be sure to pack extra layers! Don’t want to venture all the way to the Upper Peninsula but still want to feel like you’re “up north”? Check out the Sleeping Bear Dunes National Lakeshore. We love to wander through the snow-covered dunes and enjoy the views from what feels like the top of the world. And, if you are able to make it just after a large gust of wind hits the dunes, the layers of the sand change and create beautiful textures. While you’re at the Sleeping Dunes National Lakeshore, make sure you make a stop at Shalda Creek. This creek is small and can be hard to miss as it heads into Good Harbor Bay, but it’s beauty is unparalleled. Make sure you wear warm winter hiking boots and snow pants, or waders, as the ice may be thin! Would you rather escape to the city? On the west side of Michigan, Grand Rapids’ Rosa Parks Circle is at the center of the city’s hustle and bustle. The city ices over the park and creates an outdoor ice rink for everyone to enjoy. If you go at night, you will be surrounded by decorated trees and the twinkling lights of the city. The Circle is also close to many restaurants, nightlife, and great museums that both kids and parents will enjoy. On the east side of Michigan, Detroit transforms their downtown park into a winter wonderland and ice rink. With fun activities from skating to broomball, there is always something fun happening at Campus Martius. Campus Martius is at the center of amazing restaurant selection, sparkling lights, and entertainment. Your eyes will never tire from taking in all the sights in downtown Detroit. We love our Michigan roots and can’t get enough of exploring our great state. Do you have a favorite winter spot in Michigan? Be sure to share it with us! Also, schedule an appointment today so you can be sure you are seeing clearly when you visit these great winter spots. You won’t want to miss a single detail! Glaucoma is a group of eye diseases; the two main types are primary open-angle glaucoma (POAG) and angle-closure glaucoma. These are caused by an increase in pressure inside the eye, which leads to optic nerve damage. The optic nerve is responsible for carrying images from the eye to the brain, and if it is damaged, vision will be impaired or permanently lost. 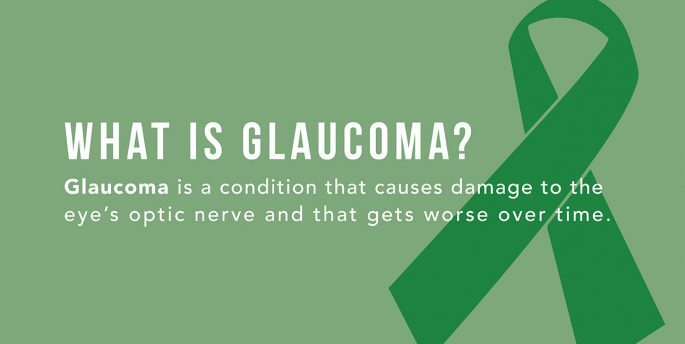 Glaucoma is one of the leading causes of blindness in the United States and it affects more than 2.7 million Americans every year. Glaucoma is known as the “silent thief of vision” because there are virtually no early warning signs to indicate glaucoma. The best way to detect glaucoma early on is through a comprehensive eye exam. Frequent patchy blind spots in your peripheral, or main line of sight, in both of your eyes can be an indication of glaucoma. In advance stages of POAG, tunnel vision will occur. Tunnel vision is when objects being viewed cannot be properly seen if they are not close to the center of the field of view. Halos around lights are an indicator of glaucoma. Halos are bright circles that surround a light source when you are viewing it, and that will ultimately interfere with your overall vision. Glaucoma can cause eye pain to occur on the surface of the eye or within a deeper structure of the eye. Eye pain should not be taken lightly, and if it persists, you should seek immediate medical attention. Along with the above symptoms, severe headaches and blurred vision are also possible indicators of glaucoma. If you experience any these symptoms it is extremely important to visit an eye doctor as soon as possible. 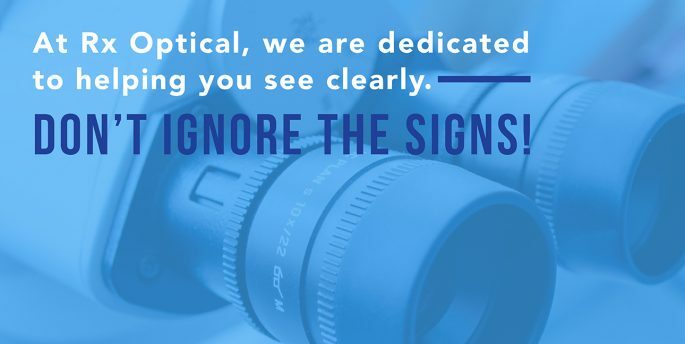 For those over 40 who are not yet experiencing any of these symptoms, it is still important to have annual comprehensive eye exams in order to detect eye diseases in their early stages and protect your vision. 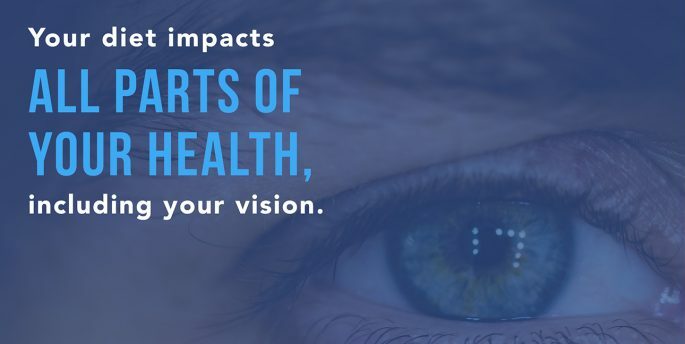 At Rx Optical, we have a deep understanding of the key indicators and risk factors associated with glaucoma and other vision-stealing eye diseases. Our expert team of doctors are here to help you protect your vision and are committed to helping you see clearer, longer. Stop in, give us a call, or schedule your appointment online. Are you straining to see at night or when working on a computer or your phone? Does your head hurt after being in front of a screen or reading fine print? These issues are not something you should live with; in fact, they are all signs of vision problem. Scheduling a comprehensive eye exam might not be at the top of your to-do list, but it should be, especially if you are experiencing vision issues and/or optical discomfort. These 5 signs are the most common indicators that your eyes need to be checked through a comprehensive eye exam. Are you noticing you can see fine in normal lighting but as soon as the lighting dims or you are in darkness, you have issues seeing? Do you are having trouble driving at night and reading signs at night? Or, do you are feel uncomfortable driving at night? These are indications that you should have your eyes checked. With these symptoms, you could be experiencing night blindness. Night blindness is very common especially in older adults and is the first symptom of a cataract. If you are experiencing sudden blurry or unfocused vision, it could be a sign of a bigger health issue. If you start to notice that text in books is becoming fuzzy when read up close it could be an indicator of farsightedness or astigmatism. In aging patients, this can also be a sign of presbyopia. Computer and phone screens can cause serious strain on the eyes and can create computer vision syndrome (CVS). Common symptoms of CVS are eyestrain, headache, difficulty focusing, itchy or burning eyes, dry eyes, blurred or double vision, and light sensitivity. If believe you are experiencing CVS, you should schedule an eye exam to discuss the strain you are putting on your eyes. In the meantime, follow the 20-20-20 rule, position your screen and documents accordingly, reduce lighting and glare, remember to blink, and use BluTech Lenses. Headaches can be common; however, reoccurring headaches can be an early warning of a change in vision. When the cornea and lens fail to focus, the small muscles in the eyes are forced to work harder, which causes eye strain and can result in headaches. Sometimes staring at a computer screen for too long or working in either dim or overly bright light may be the reason why. If you are struggling with frequent headaches, set up an eye exam as soon as possible. If you work in front of a screen often or in a dimly light room, take breaks every hour to allow your eyes to rest. If this symptom goes untreated, astigmatism, near, or farsightedness could occur. Flashes, Floaters, Obstructed Vision – Oh My! If you see floaters or flashes of light in your vision, this could indicate a serious eye disorder like a hole, detachment, or retinal tear. Small specks that move in your vision field are called floaters; they are deceiving because they often look like they are part of what you are looking at outside of your eye but they are floating inside your eye. An eye exam evaluates your vision and is extremely thorough. A comprehensive eye exam can closely resemble a physical when you consider what an eye exam can detect. If you are experiencing any of these symptoms it is important to schedule an eye exam as soon as possible to eliminate a serious eye disorder. At Rx Optical, we are dedicated to helping you see clearly. Don’t ignore the signs! Stop in, give us a call, or schedule your appointment online. Click below for tips on how to keep your eyes healthy during the holiday season. The holidays are just around the corner and if you’re shopping for the glasses-wearing friend in your life, you’re in luck! Our team has compiled the best list of gifts for those with glasses. And if you wear glasses, don’t be surprised if you add a few of these on your wish list. A lens cleaning kit is a great gift for those who wear glasses. Not only do clean glasses offer a better view, they actually prevent reflections that can occur and deter vision when wearing glasses while driving or playing in the snow. We carry an effective kit at all of our locations. The RxOptical PHD-50 Lens Cleaning Kit, which is included with our Worry FreeWarranty, contains a 6-ounce cleaner spray bottle, 30 pre-moistened lens cloths, and a microfiber cloth. Our cleaning solution is safe for all lenses and coatings, and was developed to work fast. The kit is available for $12.95 when purchased separately from our Worry Free Warranty. Stop into one of our 54 locations to pick a kit up for your glasses-wearing friend today! Everyone layers on jackets, scarves, and hats during the winter season, but most are forgetting a crucial part of their wardrobe: sunglasses. Just because the sun is not beaming high in the sky does not mean that you are free from harmful UV rays. The glasses wearer in your life will no doubt love a stylish pair of prescription sunglasses that will protect from UV rays, snow and ice glare, and harsh winter winds. Rx Optical carries a wide variety of sunglasses at all locations that you can choose from this holiday season. Microfiber cleaning clothes are a great stocking stuffer for glasses and sunglass wearers alike. Blended microfibers have the ability to pick up and lock dirt, dust, moisture, and bacteria thanks to their tiny asterisk shape. Microfiber is also positively charged which means it attracts dirt like a magnet. Microfiber cleaning cloths are inexpensive, easy to find, and serve a variety of uses beyond glasses-wearers too. If all else fails and you are running out of time to order online or make stops at lot of stores, pop into one of our offices and grab a gift card. Investing in a loved one’s eyesight will go beyond just providing clear vision, but also show that you care about their health and wellness. 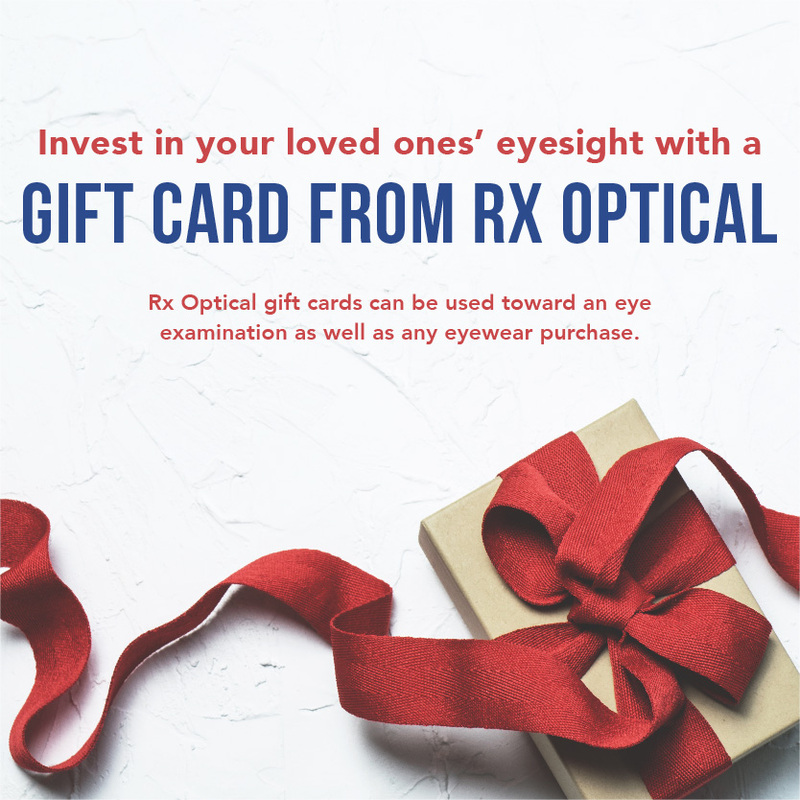 RxOptical gift cards can be used toward an eye examination and any eyewear purchase. 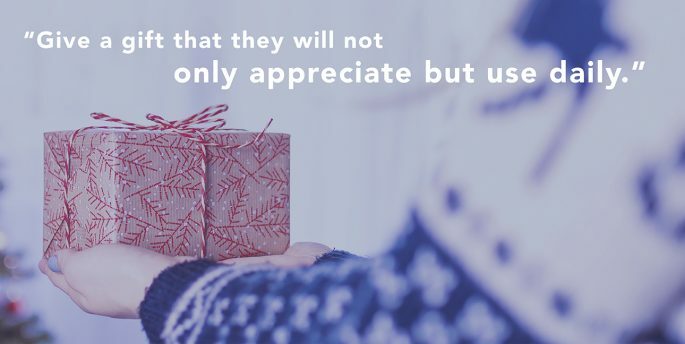 Give a gift that they will not only appreciate but use daily. These gifts are sure to bring a smile to any glasses-wearing friend or family member, and will be put to good use. Have any questions about our gift giving guide? Give us a call! Or, stop in and ask us to help you shop, our opticians are talented and ready to help you find the perfect gift. Winter is coming! In addition to Michigan winters being rough on our cars and our roads, the cold air outside combined with dry indoor heat can be a perfect recipe for dry eyes and discomfort. Thanks to the climate here in the northern Midwest, one of the most common patient complaints during the winter months is dry eyes. Harsh winter weather can reduce the moisture in your eyes, causing irritation. This eye irritation can create a burning or itching sensation, and most of the time, people will try to relieve this by rubbing their eyes, which will actually make things worse. Drinking plenty of water not only helps keep your body hydrated and healthy, but it also helps maintain moisture levels in your eyes. Did you know that the average adult should drink about half a gallon of water each day? If you’re experiencing dry eyes, be sure to examine your water intake, as you may need to increase the amount of water you are drinking. While the warmth from a fireplace or a vent is nice and cozy during the colder months, the heat blowing onto your face will inevitably dry out your eyes. If you want to keep your eyes moisturized, don’t sit directly in front of the fireplace, a space heater, or a heat vent. Do you wear contacts every single day? Are you remembering to give your eyes a break from contacts once in a while? Contacts create a barrier that prevent oxygen from getting to your eyes, which can eventually dry out your eyes. If you’re suffering from dry eyes, take out your contacts for a few days to alleviate irritation and stick with your glasses. You should also consider talking to your optometrist about switching to contacts that are better suited for those with dry eye symptoms. The sun doesn’t set with summer, so you should always remember to wear sunglasses in the winter. Sunglasses will protect your eyes from damaging UV rays and will help block out any harsh winds that could dry out your eyes. One of the worst things that you can do to your irritated and dry eyes is rub them. We know it is tempting, and can feel like an easy solution, but it will only worsen the irritation and can even lead to infections if your hands aren’t clean. At Rx Optical, we want to help you have fun and enjoy the winter months in Michigan. 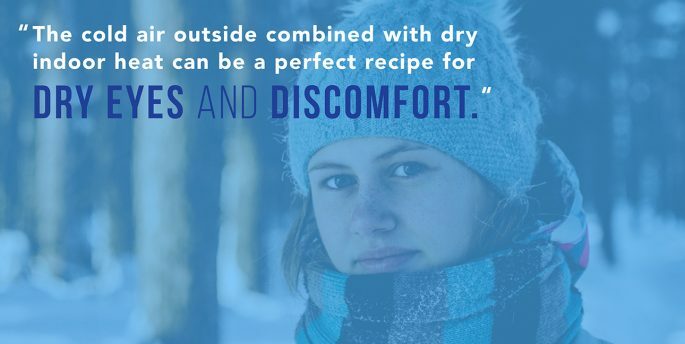 If your dry eyes are keeping you from your favorite winter activities, stop in for a comprehensive eye exam so that you can get back in the snow without dry or irritated eyes. As you age, you may notice your eyesight getting weaker. You avoid dimly lit restaurants and the font is as large as it can be on your phone. 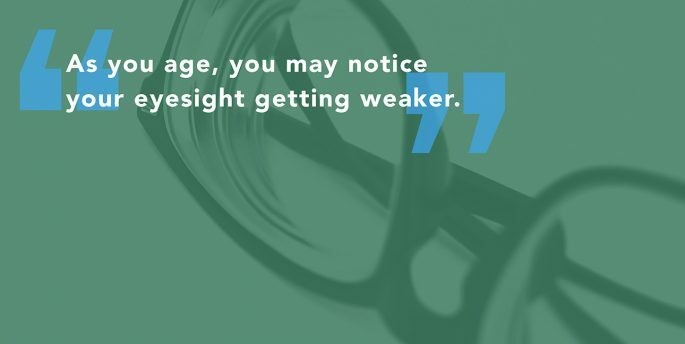 That’s because your eyes start to struggle with seeing close distances in your mid-40s, especially when you’re on your phone or reading a book or menu. This is a normal change in the eye’s ability to focus, and is called presbyopia. Presbyopia is among the most common eye problems in adults aged 41-60. While we all know that looking directly at the sun isn’t safe, being outside without sunglasses is also harmful. UV rays take no days off, so always bring sunglasses with you. Sunglasses will protect your eyes from UV rays, even on cloudy or snowy days. At Rx, we offer prescription sunglasses so that you never have to be without clear vision while protecting your eyes from damaging sunlight. Are you noticing your vision is strained when reading up close or using your phone? Updating your prescription in your glasses can help alleviate the strain in your vision. If you don’t wear prescription glasses already, scheduling an appointment with Rx is a great first step in determining if you need to wear glasses. Simply changing a few areas of your diet can help to keep your vision sharp. Including foods like eggs, legumes, citrus fruits, leafy greens, and fish in your diet can help to protect your eyes and vision. This is because they contain healthy elements like zinc, omega-3, and vitamins C and A. Interested in learning more? Check out our blog on the “Top 5 Foods to Boost Eye Health”. An active lifestyle is good for the entire body, and that includes your eyes. Exercising regularly can help to reduce your risk of developing problems that can end up leading to eye disease. Want to protect your eyes as you exercise? Ask your Rx optician about prescription sports frames. Scheduling a comprehensive eye exam is the best thing you can do to identify what is causing your eyes to strain. Our experienced doctors will be able to develop a vision plan for you and get your vision set up for success. At Rx, we employ an expert team of doctors who are committed to helping protect your eye health. Schedule an exam with us today and take the first step in protecting your eyes from aging. 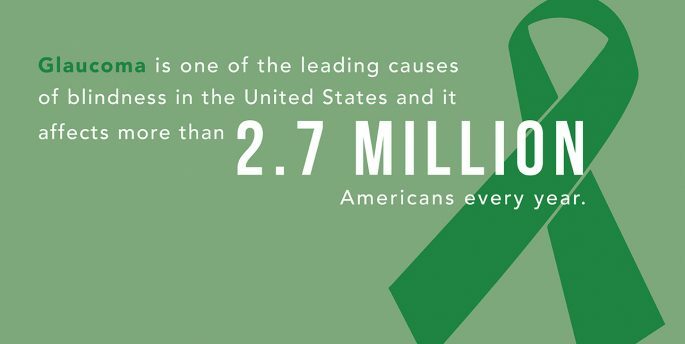 November is National Diabetes Awareness Month, and according to the CDC, there are more than 100 million U.S. adults living with diabetes or prediabetes. The serious disease, which affects the body’s ability to produce or respond to the hormone insulin, can cause health issues such as heart disease, kidney failure, amputations, and vision loss. Diabetes is a major risk factor for developing glaucoma and cataracts, but the most common and threatening vision problem facing diabetics is diabetic retinopathy. Diabetic retinopathy, which is a leading cause of blindness in American adults, is caused by damage or changes in the blood vessels of the retina due to high blood sugar levels. In certain cases, retinal blood vessels can swell and leak fluid, while others may experience abnormal and new blood vessels growing on the surface of the retina. These changes in the eye can result in vision loss or blindness. 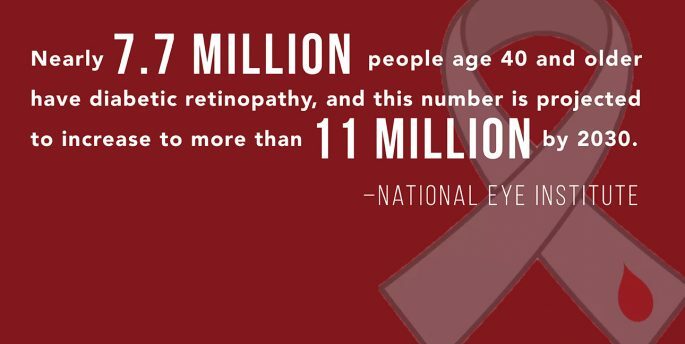 According to the National Eye Institute, nearly 7.7 million people age 40 and older have diabetic retinopathy, and this number is projected to increase to more than 11 million by 2030. The symptoms of diabetic retinopathy typically affect both eyes. While fully preventing diabetic retinopathy is difficult, you can greatly reduce your risks by controlling your blood sugar levels. If you have diabetes and experience any of the above symptoms, you should schedule a comprehensive eye exam as soon as possible. Catching and treating the disease in its early stages, before it causes vision loss or blindness, is key for protecting your eye health. It is crucial that all people with diabetes get a comprehensive dilated eye exam at least once every year. Dilated exams allow for eye doctors to see more of the inside of your eyes in order to check for signs of the disease. Our expert team of doctors at Rx Optical is committed to helping protect your eye health. Schedule an exam with us today and take the first step in ensuring that your vision stays clearer, longer. Your diet has a large impact on your overall health, including your vision. In addition to drinking enough water, maintaining a balanced diet that is high in fruits and vegetables, and low in sugar and saturated fats, is one of the most beneficial things that you can do for your eyes. Adding fish to your diet will help protect and improve your vision. Your retinas need two types of omega-3 fatty acids in order to work correctly: DHA and EPA. Both of which can be found in fatty fish like salmon, tuna and trout. Additionally, omega-3s will help protect your eyes from age-related macular degeneration, cataracts, dry eye and glaucoma. Don’t like seafood? Try taking a fish oil supplements to get a boost of omega-3s in your system. Dark leafy greens, like spinach, kale and collards, are rich in lutein and zeaxanthin and are a great source of vitamin C and beta carotene. These antioxidants will act like a natural sunscreen for your eyes and protect from harmful UV rays. If you aren’t a fan of leafy greens, try peas or avocado. Vitamin C is a key defender against cataracts and macular degeneration. You can find vitamin C in citrus fruits like oranges, grapefruits, lemons, and berries. If you’re not into fruits and are looking for a daily dose of vitamin C, try a simple vitamin C supplement that you can find at most grocery or drug stores. Kidney beans, black beans, and lentils are good sources of bioflavonoids and zinc. These two can help protect the retina and lower the risk of developing macular degeneration and cataracts. Zinc also helps to protect the eyes from damage from light. Remember, including Vitamin C, A, zinc, and omega-3 rich foods into your diet will help protect your eyes and allow you to have clearer vision, longer. Fun costumes are one of the best ways to celebrate Halloween. Depending on the costume, sometimes it takes a bit of makeup and even crazy eyewear in order to fully pull off the look you’re going for. 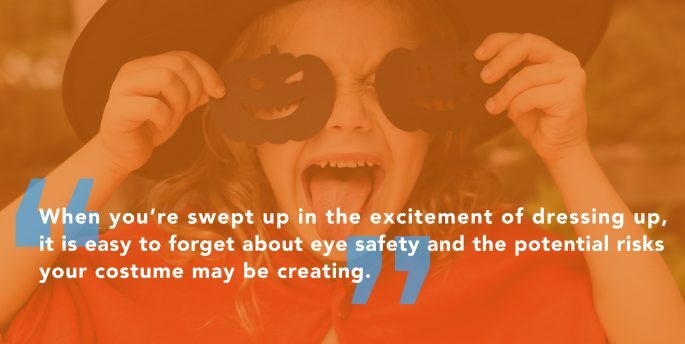 When you’re swept up in the excitement of dressing up, it is easy to forget about eye safety and the potential risks your costume may be creating. Our treat to you this Halloween season is informing you of certain costume accessories that could cause you harm and potentially ruin your Halloween celebrations. October is Contact Lens Safety Awareness Month, and, coincidently, a popular trend for enhancing Halloween costumes is cosmetic contact lenses. Cosmetic lenses can make quite a fashion statement, but when bought without a prescription at boutiques, tattoo parlors, and other nonprofessional retailers, they pose serious health risks. All contact lenses, including prescription or cosmetic, are classified as medical devices and it is illegal for anyone to sell contact lenses without a prescription, because of the medical and health risks that this creates. Non-prescription costume contacts can cut, scratch, and infect your eye if they are not properly fitted. From this mis-sizing, corneal abrasions and bacterial infections are the most common injuries that occur. Unfortunately, treatment for these injuries can require surgery and sometimes the treatment does not work. Why are costume lenses unsafe? The lenses are developed in a way that does not allow enough oxygen get through to the eye due to the paints and pigments used to create the colors in the cosmetic lens. There are about 13,000 emergency room cases each year due to the use of non-prescription cosmetic lenses. How do you get safe, colored contact lenses? The only way to safely wear contact lenses is with a prescription. Our Optometrists would be happy to determine your prescription and contact fit at an eye exam. If cosmetic lenses will complete your Halloween costume, be sure to go the safe route and schedule an eye exam. Makeup, paint, and glitter are quite common when it comes to Halloween costume essentials, but these also all pose a risk. It is important that when using costume makeup, paint, or glitter, you test a small area before placing the makeup on the entire face. It is especially important with costume makeup to keep it away from the eyes and eye area so that they eyes are protected from any irritation or stinging and burning. After the costume comes off, don’t forget to take off your makeup, too. No matter how tired you are, the irritation from costume makeup can cause infection if left on for too long, so don’t go to sleep without washing your face. Be sure to look for swelling, rashes, and irritation on the face or around the eyes the day after the makeup is applied. Watch out for any costume items that could penetrate or scratch the eye. Think plastic masks that could break into the eye or tripping while carrying a prop sword. Any accessory or prop you use should be soft, flexible, and short, in order to avoid injury to the eye. Want to learn more about safe Halloween costume practices or interested in setting up an eye exam to get a prescription for colored contact lenses? Give our office a call or schedule your appointment online. One of our doctors would be more than happy to assist in your fun and safe Halloween!